A collaboration of British and American researchers has just completed a successful clinical trial using a stem cell-derived treatment for age-related macular degeneration (AMD). While it's still in its initial phases, scientists are hopeful this new therapy could be used to treat the common sight-robbing disease in the near future. Douglas Waters, an 80-plus Londoner who had wet AMD, was the main patient involved in this study. Shortly after Waters was diagnosed with this serious strain of the disease in 2015 he agreed to have new stem cell patches implanted in his retinae. Professors at the University of California, Santa Barbara developed this stem cell solution using ocular cells. Once they were done creating this solution, UC scientists sent it across the pond to doctors at London's prestigious Moorfields Eye Hospital. 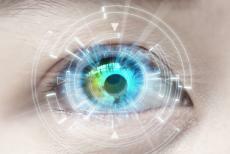 Moorfields doctors then implanted the stem cells in Waters' eyes. Before his procedure, Waters had extremely hazy vision in the left eye and was blind in his right. Doctors tracked Walters' vision for twelve months after surgery and gauged his vision. Amazingly, scientists say Waters was able to read magazines and journals shortly after his operation. Although this trial was focused on treating wet AMD, scientists believe the stem cell therapy used could have applications for the more common dry AMD. Study authors noted that most cases of wet AMD begin with dry AMD symptoms. An estimated 600,000 UK residents now have some degree of AMD. With the increasingly aging population, UK health experts expect 700,000 people will have severe AMD by 2020. The rapid rise in AMD cases will put a major strain on the National Health Service, which is a major reason why UK doctors are desperately searching for a cure. Dry AMD is characterized by a lack of central vision caused by deteriorating retinae. The more serious wet AMD, however, is due to leaking blood vessels behind a patient's eyes. Without proper care early on, either form of AMD could lead to blindness. AMD usually doesn't present obvious symptoms until it has progressed a great deal. For this reason, doctors recommended everyone over the age of 40 get at least one visual screening per year to check for the disease. Currently there's no cure for AMD, but there are many ways doctors can halt the progression of the disease. A few common treatment options include vitamin supplementation, diet changes, and laser therapy. This study was officially a part of the London Project to Cure Blindness, which involves researchers from Moorfields Eye Hospital, the National Institute for Health Research, and the University College London (UCL) Institute of Ophthalmology. Peter Coffey, who works at UC Santa Barbara's Neuroscience Research Institute, was the lead author of this study. A few other key researchers involved in this trial include the UCL's Kate Fynes and Pfizer's Tricia Harbinson. People who want to learn more about this interesting study can find the full article in the latest edition of Nature Biotechnology. The study was listed under the title, "Phase 1 clinical study of an embryonic stem cell–derived retinal pigment epithelium patch in age-related macular degeneration."